Simon Pegg, with the help of the Monty Python team, blows up Islington’s old Ashmount School in the upcoming sci-fi comedy Absolutely Anything. As a gesture of thanks to residents, the production donated to a charity providing food and shelter for the homeless locally during the winter months. Dorothy Leng, who chairs the Whitehall Park Area Resident’s Association, said the donation was very welcome: “It will help with our fund-raising activities for the Cold Weather Night Shelter which offers food and accommodation for around 12 homeless people every night in local churches between January and March. “It will also help fund improvements for the area like planting tree-pits on local streets to brighten them up. Islington features heavily in the film, alongside scenes in Camden, Southwark and Lambeth, shot between March and April last year. It’s opening on August 14th – here’s the trailer. The film is directed by Terry Jones who set out to write a script based on an HG Wells story, The Man Who Could Work Miracles, but over the course of 20 years it moved a long way from that. Douglas Adam looked over the script before he died, describing the scenes starring Dennis the Dog – voiced by Robin Williams before his death – as the funniest. Simon Pegg plays a schoolteacher who says, “I’d make an alien spaceship hit class 4C and vaporise them”, only to hear an explosion and find said classroom destroyed. This is his first clue that power-crazed aliens, voiced by John Cleese, Terry Gilliam, Eric Idle, Terry Jones and Michael Palin, have given him powers to do anything he likes. 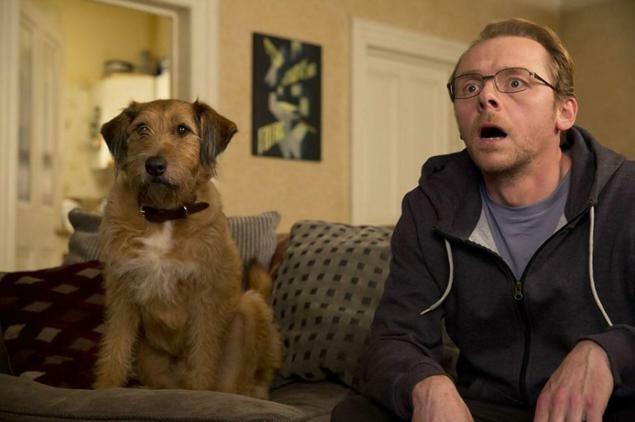 Aside from scenes filmed in the former Ashmount School, which also featured Eddie Izzard as the head teacher, Islington residents will spot Bunny Little’s Bakery on Campdale Road, where Simon Pegg stares at his reflection in the window, and wishes he could be President. Promptly, a presidential limousine appears and four security men spill out. Then shots are exchanged between the security men and terrorists hidden in the Fiat showroom on Campdale Road. They’ll also see the Narsi Supermarket on Junction Road, when two lead characters drop by for some late night shopping. Simon Pegg and his dog Dennis chase a CGI whisky bottle down Cressida Road toward Whitehall Wines on Cheverton Rd. At Whitehall Wines the bottle attempts to break into the shop – setting off the alarm and breaking the window. Simon Pegg runs off and into a policeman, who Dennis bites. In the film, Simon Pegg cycles to work along Cressida Road, and at one point, close to the junction with Cheverton Road, there’s a minor collision with a car. After the exchange of some ripe dialogue, the motorist leaves. But during the fall, Pegg is mysteriously zapped on the wrist from outer space. In Archway Close and Flowers Mews a group of onlookers laugh as three policemen climb out of a car, with big ears, ducks’ feet and pink uniforms. The action moves to Camden’s Granary Street when the presidential limousine is chased, with shots being fired. In Camden’s Lissenden Gardens zombies are raised from the dead and go looking for the person who brought them back to life. In Southwark, the Neo Building on Holland Street was used to film interiors. And in Lambeth’s Brad Street you’ll see Kate Beckinsale leave Number Three, when Simon Pegg pulls up in a convertible sports car. FilmFixer manages the film office for Islington, Camden, Southwark and Lambeth councils. FilmFixer director Karen Everett praised the production for its good relations with locals on such a big shoot, saying, “It’s quite a challenge to manage a big cast and crew based in a residential neighbourhood for some time. “In this case, the goodwill and engagement was exemplary. Most residents were delighted to know that some of our favourite stars were working nearby.